Alexandru Ioan Cuza University of Iasi is the oldest public university in Romania and one of the advanced research and education institutions in the country. It was founded a year after the establishment of the Romanian state, by a decree given in 1860 by Alexandru Ioan Cuza, under whom the former Academia Mihăileană was converted into a university. Known at first as the University of Iasi, Alexandru Ioan Cuza University became the first student-centered university in Romania, once the Bologna Process was implemented. The city of Iaşi became the host of the oldest higher education institution in Romania by no mere coincidence. This is a territory with a long academic tradition. The Moldavian Prince Vasile Lupu founded here in 1640 Academia Vasiliană, which in 1707 became the Princely Academy of Iasi, renamed later, in 1812, The Academy of Philology and Science. In the 17th century, the Academy of Iaşi was already synchronized with the European spirit and model, matching up to the standards of the other European Academies of the time, and the Romanian language gained importance over the Greek language, which was the language of culture in the European Orient. 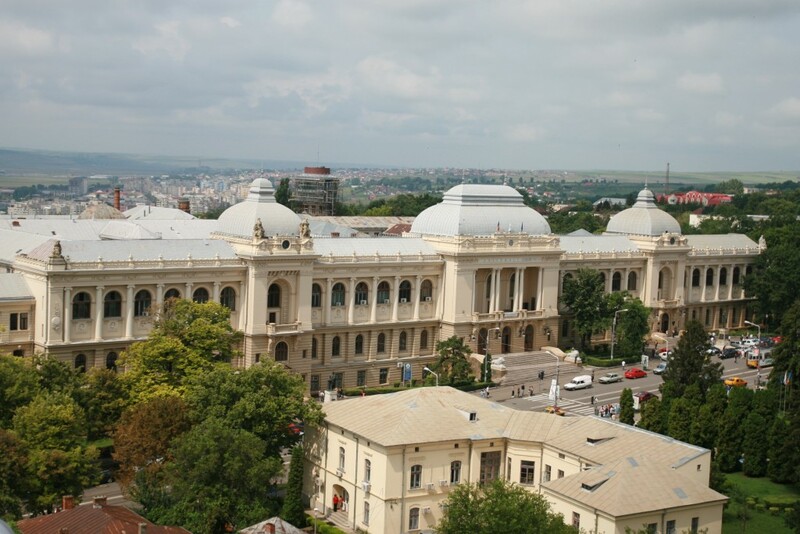 The university grounds lie on Copou Hill in the northern part of the city, the main university building, built between 1893 and 1897, lying on the site of the first National Theatre of Iasi which burned down in 1888. 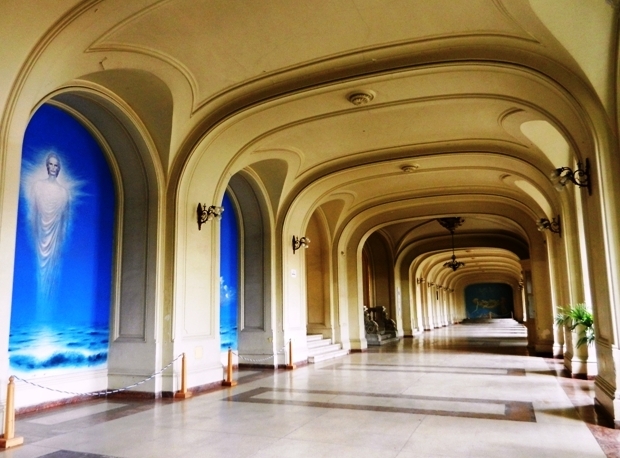 One of the most famous rooms within the University is The Hall of the Echoing Footsteps. This place, which during the time when Iasi was the capital of Romania served as a parliamentary debating chamber, between 1917 and 1918, has been introduced in the great art galleries of the world by one of the most famous contemporary Romanian painters, Sabin Bălaşa. In 1967, he started creating a series of strongly romanticized frescoes which bear, according to the art critic Valentin Ciucă, “an essence of uniqueness” given, among other things, by the composition vigor and by the particular chromatics and themes. The coat of arms of Ioan Cuza University of Iasi is another element that bears symbolic meaning. Apart from the Y shaped heraldic pall standing for the three initiatives which led to the foundation of the University (the Trei Ierarhi Collegium, Academia Mihăileană, the University of Iasi) and the Bible represented in the middle, which is the classic emblem of higher education, there are also three shiny stars. They symbolize the first three faculties that were set up at the foundation moment: the Faculty of Law, the Faculty of Philosophy and the Faculty of Theology. Today the university counts 15 faculties (Biology, Chemistry, Computer Science, Economics and Business Administration, Geography and Geology, History, Law, Letters, Mathematics, Philosophy and Social-Political Sciences, Physical Education and Sports, Physics, Psychology and Education Sciences, Orthodox Theology, Catholic Theology), and one department (the Center for European Studies) with more than 25000 students and 800 people in the academic staff. Ever since 1860, the university has been developing and improving in the fields of education and research, nowadays enjoying international prestige, for it cooperates with 286 universities world-wide. It is a part of important university networks and associations, which makes possible to have student and teacher mobilities and joint academic, research and strategy programmes: the Coimbra Group, EUA – European University Association, Utrecht Network, International Association of Universities, University Agency of Francophony and the Network of Francophone Universities (RUFAC). In the 2012 QS World University Rankings, Alexandru Ioan Cuza University was included in the Top 700 universities of the world, together with three other Romanian universities, while in 2008, for the third year in a row, it was placed first in the national research ranking compiled on the basis of Shanghai criteria. Being involved in over 400 national and international research projects, with the logistic support of 24 research centers, this university continues to strive for excellence, stimulating, encouraging and involving its best students in the academic life.